The last time we caught up with Blackmore's Night in Tarrytown it was the day preacher Harold Camping proclaimed would be the end of the world. This time around an apocalyptic sounding "Frankenstorm" was bearing down on the region. This was an interesting coincidence because as we'll see below -- the more things change for Blackmore's Night -- the more they stay the same. 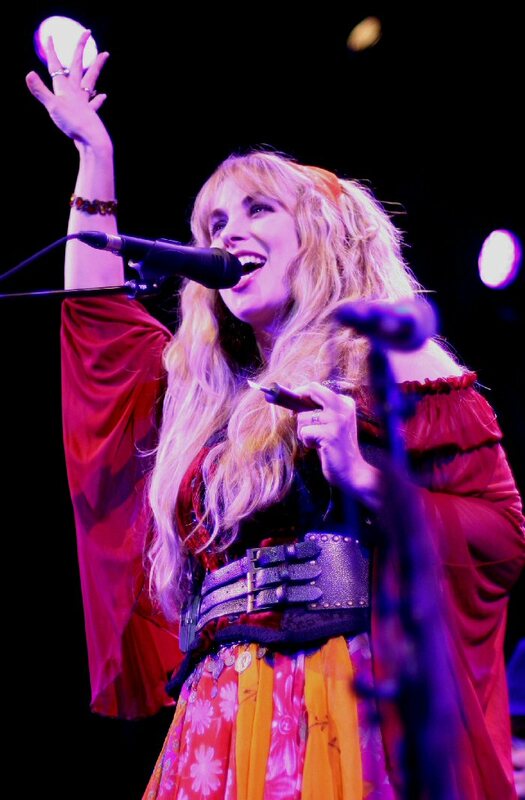 Candice Night on stage in Tarrytown, New York in 2012. Ritchie Blackmore and Candice Night have been casting their musical spell together for over 15 years. Their band Blackmore's Night has been at the fore-front of Renaissance rock for much of their history. For a group that wears medieval clothes (garb) on stage, Halloween is an ideal time of year to be on tour. Blackmore's Night played several dates on the east coast in the fall of 2012 with a stop at the Tarrytown Music Hall in New York on October 25th. Many identify Ritchie Blackmore as the driving force behind both classic hard rock bands Deep Purple and Rainbow. 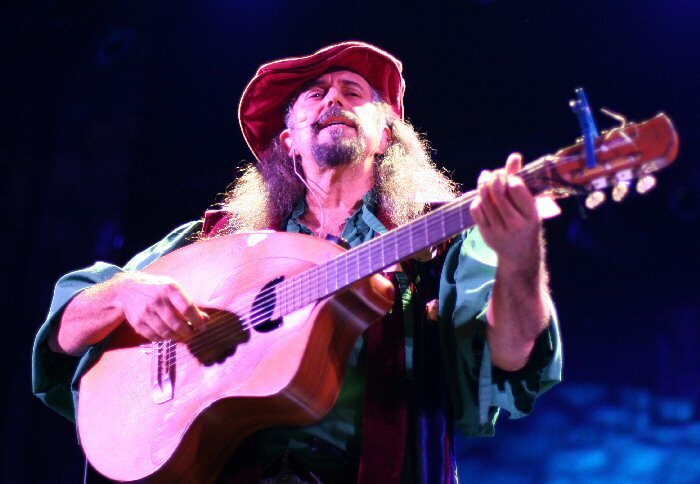 But in the 1990's, he changed direction and since then has become a medieval master of not only the guitar but the mandolin, mandola and the hurdy-gurdy. Candice Night is his leading lady who sings and plays Renaissance woodwinds. Supported by various talented teams of minstrels the pair have carved out their own musical niche that usually does well on the New Age charts. Blackmore's Night took the stage as a retooled outfit with three new members - a violinist, bass player and backing vocalist. They were celebrating - as has become their custom - the high charting of their most recent A Knight in York live CD/DVD combo package on Billboard. The current group sounded well-rehearsed and were up to the quality fans have come to expect from the world's leading renaissance folk rock band. 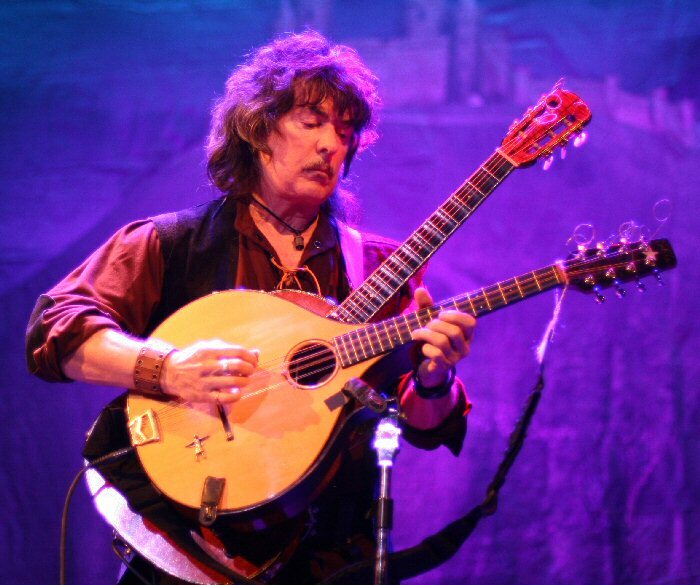 Ritchie Blackmore on stage in Tarrytown, New York in 2012. As is often the custom at a Blackmore's Night show a percentage of the fans were clad in medieval clothes. Their stage was set to look like a castle with rocks and plants used to camouflage modern equipment as much as possible. The backdrop behind the stage was a picture of a castle lighted by hues of blues and greens. "God Save The Keg" echoed in the classic theater as the crowd clapped in anticipation of the minstrels taking the stage. They opened with a beguiling "Locked Within The Crystal Ball" with its array of instruments adding to the mystical mood of the piece. "Queen For A Day" flowed on the pageantry of spirited medieval sounds. Candice was in good voice and is a very pretty and personable lead singer. "Hello everyone! Thank you for coming out tonight," greeted Ms. Night. She chatted a bit about fans who had come from as far as Australia and Japan for the Tarrytown show. She also touched upon the fact that her and Ritchie had gotten married in a castle in the region and are now the proud parents of a girl and a boy. Candice jested that it is Mr. Blackmore's job to the teach the children to speak and their daughter Autumn's first words were, "what kind of beer is on tap"? Candice Night recently released her debut solo CD, Reflections. Candice invited Tarrytown to sing along to the vibrant "Under A Violet Moon". Many of the fans in garb danced in front of the stage which compelled the musicians - even Ritchie - to play right at the edge of the stage adding to the festive atmosphere. Before performing a delicate yet dynamic "Soldier of Fortune" Candice said that it was "still one of our favorites to do". "Durch den Wald zum Bach Haus" followed and as the name implies had the textures and tones of German folk fare. "All The Fun Of The Fayre" was dedicated to those who came in garb. The piece was feisty and had fans on their feet. They paid tribute to the queen of folk music (Joan Baez) with a stark and soulful "Diamonds & Rust". Beforehand, Ritchie had jokingly asked Candice who the queen was - "do you mean Bruce Springsteen?" Mr. Blackmore handed out mugs to a few fans before the band played "Toast To Tomorrow". The tune overflowed with Russian flavors with the minstrels adding a modern and fun flair to the piece with parts from Lady Gaga's "Bad Romance". "Greensleeves" started off with gentle strumming but then Bard David of Larchmont on the keyboards created a distraction with a beer bottle and the lyrics and tone of the classic became a comical drinking tune. The next series of songs showcased solos. At one point Ritchie switched from the various acoustic instruments that he had been played to his signature white Stratocaster. Now, the non-garb fans surged forward to watch Mr. Blackmore apply a more heavy blend of techniques and touch to his jam. Ritchie Blackmore was nominated for induction into the Rock and Roll Hall of Fame in 2012. "Home Again" was enchanting and engaging. The evening closed with a spirited "Village Lanterne". Just like the last time at the venue - and despite much applauding and foot stamping - the band did not return for an encore. The full two-hour concert had again run up against a curfew but they definitely provided a complete set that ran the gamut from reflective to rocking. 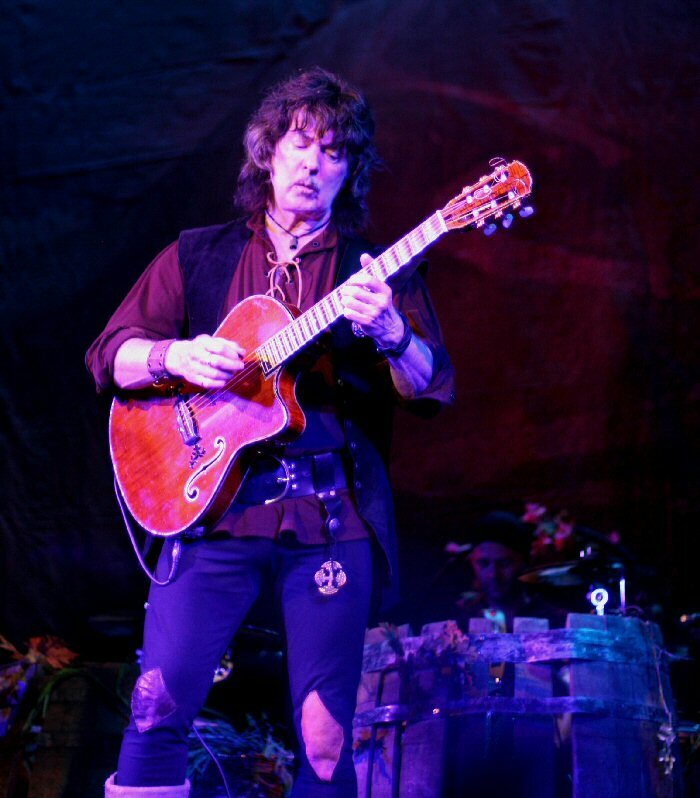 Carl Asch had met the Blackmores at the Largo Renaissance Festival and was asked to open for the band. Carl played stringed instruments and sang songs that fit in well with the theme of the evening. Asch was chatty during his set and shared that he had the pleasure of recording a song "By The Hills" with Candice Night. He performed the pretty Scottish flavored song that had a message about enjoying the moment. Carl asked his friend Laura Crisci to help him close his set. She played an acoustic allowing Carl to utilize a wind instrument. The two shared vocal responsibilities on the poignant "Until They Meet Again". Blackmore's Night have been busy with their growing family but still had time to release new products. The first is A Knight In York recorded live on September 30th, 2011 and is available in multiple formats. Second is Candice's first solo album entitled Reflections which is a blend of folk, pop and rock. The ten-track CD draws from a broad pallet of emotions, inspirations and mystery and should appeal to her fan base and beyond. Carl Asch opened the show with an engaging acoustic set.